Product DescriptionOne New Year’s Day, Noelle Oxenhandler took stock of her life and found that she was alone after a long marriage, seemingly doomed to perpetual house rental and separated from the spiritual community that once had sustained her. With little left to lose, she launched a year’s experiment in desire, forcing herself to take the plunge and try the path of Putting It Out There. It wasn’t easy. A skeptic at heart, and a practicing Buddhist as well, Oxenhandler had grown up with a strong aversion to mixing spiritual and earthly matters. Still, she suspended her doubts and went for it all: a new love, a healed soul, and the 2RBD/1.5 BA of her dreams. Thus began her initiation into the art of wishing brazenly.In this charming, compelling, and ultimately joyful book, Oxenhandler records a journey that is at once comic and poignant, light and dark, earthy and spiritual. Along the way she wonders: Does wishing have power? Is there danger in wishing? Are some wishes more worthy than others? And what about the ancient link between suffering and desire? 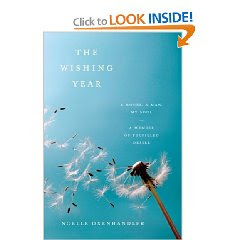 To answer her questions, she delves into the history of wishing, from the rain dance and deer song of primeval magic to modern beliefs about mind over matter, prosperity consciousness, and the law of attraction.As the months go by, Oxenhandler is humbled to discover the courage it takes to make a wish and thus open oneself to the unknown. She is surprised when her experiment expands to include other people and other places in ways she never imagined. But most of all, she is amazed to find that there is, indeed, both power and danger in the act of wishing. For soon her wishes begin to come true–in ways that meet, subvert, and overflow her expectations. And what started as a year’s dare turns into a way of life.A delightfully candid memoir, unfettered, poetic, and ripe with discovery, Oxenhandler’s journey into the art and soul of wishing will inspire even the most skeptical reader to search the skies for the next shooting star. This book is based on using the theories behind The Secret. I thought it was a bit whiney in tone and that the author didn't need the "secret". She just needed some hard work and determination in finding out which goals were important to her and then apply that hard work to obtain them. Overall, it was an OK read.